It is generally understood that the goal in customer service is to have effective communication with customers, which will result in customers being satisfied and will produce more revenue for the company in the end. However, what is effective communication? What does it include and how a company can achieve it? Breaking down your plan into smaller sections which are easy to understand and convey to employees is the way to go. A stretched in time conversation usually is a sign that the interaction is not happening effectively and the customer will leave unhappy. So it is better to set up a time frame for each live chat that the agents should try to stick to. At the same time, they should not feel pressed for time and should not rush the customer. There are different customer service situations and sometimes taking the time and bringing to peace a frustrated customer or solving a difficult technical issue effectively is well justifiable. The general guideline for the customer service agents could be to keep the live chat interactions as short as possible without compromising the quality of the service. Customers turn to live chat mostly because it promises them instant answer or solution to their problem. Offering live chat on your website and not answering it timely turns it into an email service and renders it pointless. So try to establish it as a priority to answer live chat requests as swiftly as possible. If short delays are inevitable for your company, set up an appropriate welcome message which will inform the customer whether they should wait or use other contact options to reach you. Studies have consistently shown that customer satisfaction reduces by 10% or more if they have to contact you a second time. No matter how good a product or a service is, there are always bound to be some issues. While it may present a challenge for the customer service agents to solve difficult service or technical issues in the first take, without additional research or taking advice from colleagues, they need to know it is very desirable. Train them to react to situations swiftly and be creative. For example, they may truly not know the answer to the customer’s question, but they can estimate the complexity of the request and for example, ask a few minutes from the customer, do a quick online research and give a relevant answer to the customer. Applying our creativity can do miracles and we can solve issues which may seem difficult at first glance in no time if we only care to try. To achieve great customer satisfaction it is important to learn not to ignore a single customer’s question or issue. All of us provably experienced careless treatment from customer service when we felt our issue was just not important to the representative and we would be given an unclear answer just to shake us off. So the agents need to be clear that they should treat every customer’s issue with full respect and attention. A lot of the times what is hiding behind their careless answer is just not knowing how to help and solve the issue. So they need to be trained confidence. And confidence means being able to acknowledge that you don’t have an answer right away, knowing how to tell that to the customer correctly and ask for more time, knowing to whom to escalate the issue or who to ask help for. Putting it short, the customer service rep needs to have clear instructions and understanding how to act in any possible customer service scenario. Nowadays a great customer experience have become far more important than the product itself. It has become the main differentiator between the brands offering similar products and services. Emotionally connecting with your customers potentially creates a long-term relationship with them, greater satisfaction for the customer and more revenue down the line for the company. The best way to start creating meaningful connection with customers is to empower your customer service agents to use their own judgement in different situations and do what they feel will be best for the customer and their company. This will make them feel more responsible and part of the situation in which their effort matters. If they are just given scripts from which they cannot deviate, it will be impossible to create any sort of genuine connection with the customer. 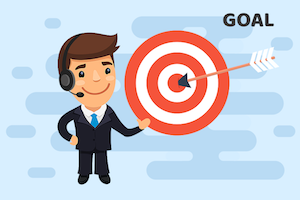 Going one step further in your live chat goal setting is to teach your agents to prevent possible future customer service issues by educating customers. This may sound a bit complex, but in fact, it is easily put to practice. What is required from the agent in any particular situation is to give the customer additional information concerned with the question or issue currently being addressed. Their answers need to be short and precise, but at the same time they should contain full information which not only addresses the current issue, but also prevents future questions. For example, answering a simple question, “When is the next release of the app coming out?” the agent could say in short, “We expect it in 8 weeks”. Another way to answer would be, “We expect the next release in about 8 weeks. You can sign up for the newsletter on our website if you don’t want to miss it. Or you can follow our social media pages, we will post an update about the next release shortly”. This way he will prevent other questions which will potentially come up in the customer’s mind and will make him contact you a second time later. Such an answer may also help you to increase your social media following. So there are many benefits to giving as full and detailed answers to customers as it is possible. Based on my 10-year experience in customer service, these are the most important goals to set for your customer service agents in order to have an effective team. By following these guidelines support agents feel more confident in the value they provide to the customer, because they see instant feedback from customers and show great results overall. What do you think about it? Did you give a different twist to your customer service training? What goals did you set for your team? Please share with us in the comments! These are great recommendations, thank you for sharing with us. Working with your customers is a very important part of any business. If you want to be successful and succeed – appreciate your customers and establish the process of their service. This is a great article. Gives additional information on customer’s perspective. Keep posting! it is always very important to evaluate the customer’s point of view. I’m really enjoying the articles, thanks again! Whether you’re a director, Business representative, or sales executive your goals should contribute the larger bottom line objectives of the company.